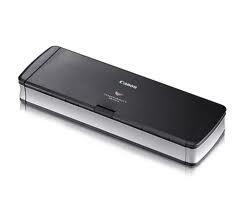 Canon DR-P201 Scanner The P-201 is a portable scanner for scanning on the go of important documents just a plug away. It works with USB Power and extremely light weight delivering true balance between portability and functionality. The CR-135i can handle large numbers of checks and other related small documents. The CR-135i delivers exceptional document handling with-Corrugated Retard Rollers.